I found this recipe in my Pillsbury Bake-Off booklet (37th contest) - a booklet that I've had for ages. In fact, one of our favorite meals comes from that booklet, Sweet Potato and Black Bean Burritos, but I had never noticed this recipe. I'm not sure why because it's pictured on the front page of the booklet. But this time, when I went to put the book away, I happened to notice the picture, and I just had to look up the recipe, and then I just had to make it. I'm taking it for a potluck tomorrow, so I hope it tastes as good as it looks and smells. In medium bowl, combine filling ingredients; mix well. Set aside. Heat oven to 350° F. Grease bottom of a 10-inch springform pan. In large bowl, combine all brownie ingredients. Beat with electric mixer at low speed until moistened. Beat at medium to high speed 1 minute. Pour brownie batter into greased pan and spread evenly. Using spatula, make a 1-inch wide circular groove in the batter, about 1 inch from the edge of the pan. Make a second groove about 1 inch from the first one. Spoon filling into grooves and press down gently so that it is level with the brownie batter. Bake at 350° F for 55-60 minutes or until set in center. Note: the center will raise up, but it settles down after the torte is removed from the oven. Cool 15 minutes and remove sides of pan. Cool completely - 1 to 1-1/2 hours in the refrigerator. In a small bowl, combine Glaze ingredients. 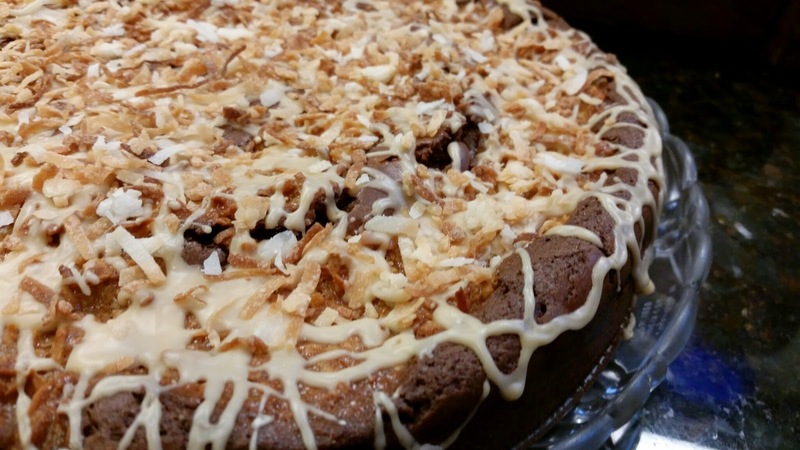 Drizzle over top of cooled torte and garnish with toasted coconut. To toast almonds: Spread almonds on baking sheet. Bake at 350° F for 5 to 10 minutes or until light golden brown and fragrant, stirring occasionally. Cool slightly before chopping. To toast coconut: Spread on baking sheet. Bake at 350° F for 3 to 5 minutes, stirring occasionally. Keep a close eye on it so it doesn't burn. I don't usually buy cake mixes or brownie mixes, but I just happened to have one this time. I bet my regular brownie recipe can be used in this recipe, so I'll have to try that next time. See, I'm already saying next time - because this smells so good. 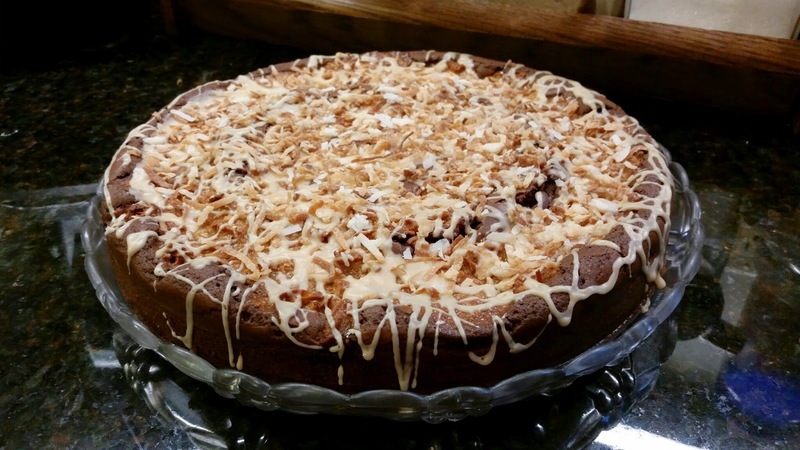 Chocolate, coconut, almond, all kinds of yummy flavors together. And then the Irish Cream glaze on top. The original recipe called for a vanilla glaze flavored with amaretto and a chocolate glaze - and then a garnish of slivered almonds. 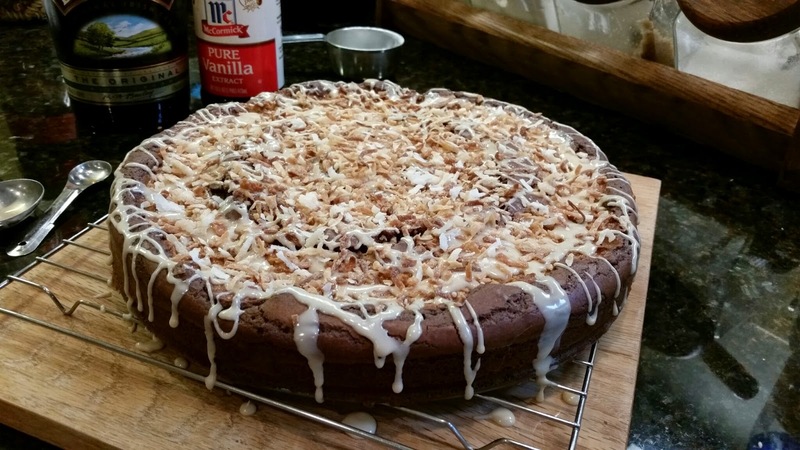 I bet that's really good, too - but, I decided to just go with the one Irish Cream glaze and toasted coconut, because the slivered almonds I found in my pantry were old and didn't taste good anymore. Also, that vanilla glaze called for store-bought vanilla frosting, which I have never bought, so I was going to have to make something up anyway. Baileys and Amaretto - it wasn't a huge stretch. It's a miracle I didn't just cut into this already. 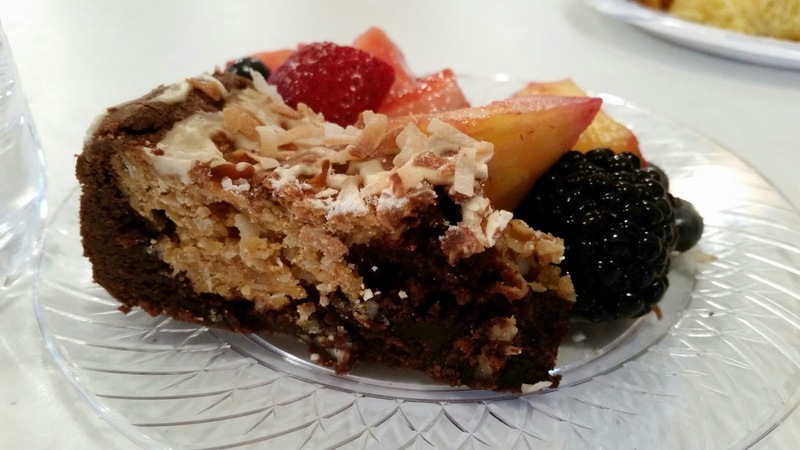 There's nothing wrong with taking a dessert to a potluck with a wedge or two missing, right? Or not. Hopefully I'll get a chance to grab a picture (and a taste) once it's cut. I have noticed that anything chocolate seems to go quite quickly at potlucks, so we'll see. I may just have to make another one really soon - especially since this recipe only uses about 1/2 the can of sweetened condensed milk. I have to find something to do with that other 1/2, don't I? It was yummy! I managed to grab a small sliver, and the rest disappeared completely. I talked to a few people who had some, and they all agreed that it was very good.